Rocket into battle with this incredible 3-in-1 Triple Strike Cruiser vehicle! 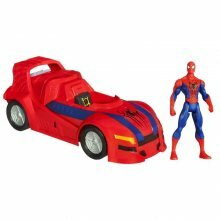 Your Spider-Man figure has 3 ways to attack when he's at the wheel of this incredible crime-fighting cruiser. The Triple Strike Cruiser launches into instant attack when you press the button on the launcher – it separates into a Web Glider and a Spider Racer! No matter which vehicle your Spider-Man figure attacks in, your web-slinging adventures are going to be in high gear! 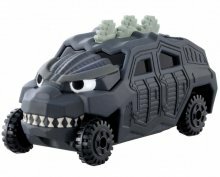 A Special Edition Tomica model car that celebrates Godzilla, the world's favorite Japanese monster. Features authentic details and decors inspired by the film series. Combines two of boys' favorite things: Matchbox and dinosaurs. 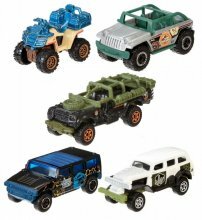 Great for kids or collectors, this 5-pack was inspired by the film series with the real-action adventure and attention to detail Matchbox is known for. Re-create your favorite film scenes or create your own prehistoric adventures.